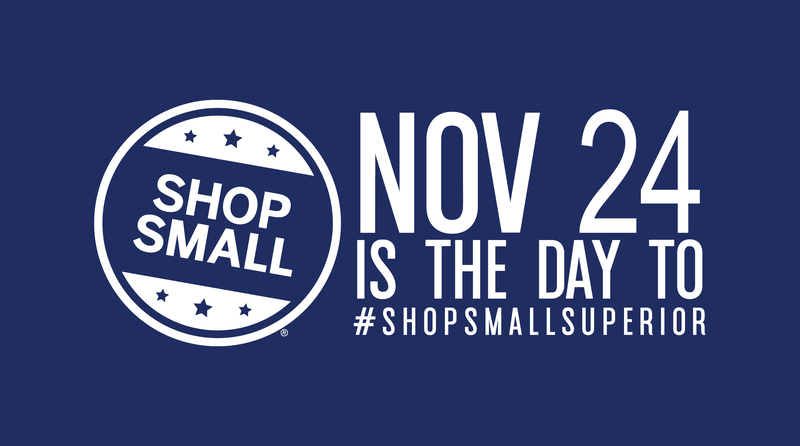 Are you ready to #ShopSmallSuperior? After scoring some Black Friday shopping deals, remember to save a bit of your holiday shopping for Small Business Saturday on Saturday, November 24! Multiple Superior Businesses will be participating in this national shopping holiday by offering deals, discounts, samples, customer appreciation activities, and more! Show your support for your neighborhood businesses by shopping local on Small Business Saturday! The list of participating businesses is constantly updating, be sure to check back often for more details! Information about our Small Business Saturday Passport for prizes is at the bottom of this page (scroll down). Businesses with a heart symbol and a link are members of the Superior-Douglas County Area Chamber of Commerce. We love our members! Businesses with stars are businesses within the Superior Business Improvement District. All addresses in Superior unless noted. Happy Small Business Promotion from Art on the Planet! We are saying goodbye to 7 of our current scents to make room for our new scents. Scents to be discontinued: Cherry Jubilee, Coconut Lime Twist, Cuke-Melon Splash, Hawaiian Paradise, Love Enchanted, Sensational Sandalwood and Sunny Sunflower. Mason Jars will be $8 each or 2 for $15. Our new scents include Bakery Fresh Bread, But First, Coffee, Coffee Shop, Cranberry Woods, Lemon Chiffon, North Shore Breeze, Paradise Escape and Teakwood Magohany. 10% off all wines in the liquor store - Does not include case pricing and discounted wines. Bloody Mary's all day for just $3.75 to help you recharge after all your shopping! Triumphant Deal - One Triumvirate sandwich lunch and a small cup of coffee for $9.99! This deal is only good on Small Business Saturday. Fall breakfast special - One sausage egg sandwich and a small maple latte for $10! This deal is good through December 1. Also there will be a pop-up shop featuring Joe Polecheck Photography! Buy a one hour message gift certificate for $60 and get a bottle of Biofreeze free ($12.50 value). Online order for MyPillows at $35 (Retails at $40). Medicinal mushroom tea, coffee, and supplements are 20% off. Clean label skin care - buy a vitamin mix and c and get a free charcoal cleanser. Clean label skin care - eye bundle, grow long lashes quick, fix under eye dark circles and puffiness, three products for $91.97. Other clean label skin care and tech tool products 20% off. The first 50 customers get a free gift. There will also be a drawing for 3 - $20 gift certificates! Coffee and treats will be served. All promos on Small Business Saturday Only. To celebrate Small Business Saturday, we're offering several special deals to you, our valued customers. Product discounts - Buy two get one FREE including all AVEDA products. Stop in for some painting fun with Santa & Mrs. Claus! For $10 you will get to paint a ceramic Ornament, have a cookie with milk and spend some time with Mr & Mrs. Claus! Don't forget your camera! Studio One Photography will be taking appointments every half hour throughout the day on Small Business Saturday, offering a delightful set and gift for the kids! The session is priced at $99 and includes one-8x10, two 5x7’s, one image file and a holiday gift! Call 715-392-2747 for your appointment. Pets welcome! We will have cider and cookies too! One free pretzel with purchase of any sized TPB featured Pizza! The Mac n' Cheese with Bacon Za' and our Roasted Veggie Za' are the featured specials November 16 - 29th. Pretzel promo only available on Small Business Saturday. Thank you to the following participating businesses for donating a prize to our passport give away & congratulations to the winners! Winners may contact the Chamber at 715-394-7716.